nautische Instrumente und Armbanduhren höchster Präzision und Qualität spezialisiert. Vorsprung vor Greg Van Avermaet und Alejandro Valverde erfahren. Letzterer konnte die Trofeo Cyclissime im Jahr 2015 mit dem bisherigen Rekord von 366 Punkten gewinnen. In der aktuellen Saison steht momentan der dreifache Weltmeister Peter Sagan mit über 100 Punkten. denen auch die Profi-Wertung geführt wird. Zum Tipp-Spiel mit radsportspezifischen Preisen gelangen Sie hier: https://game.cyclissime.com/de/. Das erste Monument Race des Jahres, jetzt in seiner 109. Ausgabe, kündigt seine Startliste an. Mailand, 16. März 2018 – Die 109. Ausgabe von Milano-Sanremo, dem ersten Monument-Klassiker der Saison, findet morgen um 9.45 Uhr auf der Piazza Castello statt und endet nach 291 Kilometern in der Via Roma, wobei 175 Fahrer 25 Teams repräsentieren (18 UCI WorldTeams und sieben Wild Cards), jeweils bestehend aus sieben Fahrern. Unvorhersehbar wie eh und je – wie der Wetterbericht – wird La Primavera mit dem Sieger 2017, Michał Kwiatkowski, dem zweitklassierten UCI Straßenweltmeister Peter Sagan und dem Drittplatzierten Julian Alaphilippe, unter die Favoritenliste des Vorjahres gehen. Diese Fahrer unter den Sprintern, Elia Viviani, Marcel Kittel, Arnaud Demare, Alexander Kristoff, André Greipel, Caleb Ewan, Mark Cavendish und Michael Matthews herausfordernd, und unter den Eintagesspezialisten, Greg Van Avermaet, Vincenzo Nibali, Philippe Gilbert, Matteo Trentin, Filippo Pozzato und Edvald Boasson Hagen. Es gab eine kleine Änderung auf dem Kurs, jetzt 294 km lang: nach Basaluzzo geht das Rennen auf die rechte Seite des Flusses Orba über Predosa und Roccagrimalda Stazione, Rückkehr auf den ursprünglichen Kurs in Ovada. Diese Änderung ändert nichts am technischen Charakter des Rennens, macht es aber 3km länger. Der 109. Milano-Sanremo NamedSport wird in 193 Ländern auf allen fünf Kontinenten ausgestrahlt. Die Ausgabe 2018 wird live von 14 TV-Sendern gezeigt. RAI, der Host Broadcaster der WorldTour-Veranstaltung, wird vier Stunden vor und nach dem Rennen zwischen Live- und Special-Rennen berichten und in Italien auf Rai 2 senden. In Europa wird La Chaine L’Équipe La Primavera in Frankreich senden, während das Rennen in Belgien auf Medialaan-VTM in Flämisch und auf RTBF in Französisch verfügbar sein wird. Eurosport wird in 53 europäischen Ländern und in 16 Territorien im asiatisch-pazifischen Raum mit Kommentaren in 20 verschiedenen Sprachen senden. Das erste Monument der Saison wird live in Südafrika auf Supersport, in den verbleibenden Ländern südlich der Sahara auf Kwese Sports und in ganz Nordafrika und im Nahen Osten auf OSN übertragen. In Amerika wird das Milano-Sanremo auf Fubo.TV in den USA und Kanada, auf TDN in Mexiko und Mittelamerika ausgestrahlt, während das ESPN-Netzwerk Brasilien, die restlichen Länder Südamerikas und die Karibik abdecken wird. Rennen wird in Japan auf DAZN live sein, während in Neuseeland wird auf Sky Sports übertragen werden. Kwiatkowski, Sagan, Van Avermaet, Štybar and Van Aert among the challengers for victory through the Crete Senesi. The women’s race, which started at 09:12, also attracted the world’s best including Longo Borghini, Van Der Breggen, Niewiadoma and Ferrand Prevot. Today’s winners press conferences will be held at the end of each race. Siena, 3 March 2018 – The men’s edition of the ‚Northern Classic in the South of Europe‘, now in its 12th edition, organised by RCS Sport/La Gazzetta dello Sport and part of the UCI WorldTour calendar, started today from Siena at 10:43 with 146 riders. Did not start: dossard number 167, Maarten Wynants (Team Lotto NL – Jumbo). In the men’s Strade Bianche NamedSport eyes will be focused on many champions such as last year’s winner Michał Kwiatkowski and Gianni Moscon (Team Sky); Romain Bardet (AG2R La Mondiale); Moreno Moser (Astana Pro Team); Vincenzo Nibali (Bahrain – Merida); Greg Van Avermaet (BMC Racing Team); Peter Sagan (Bora – Hansgrohe); Alejandro Valverde (Movistar Team); Philippe Gilbert and Zdenek Štybar (Quick-Step Floors); Edvald Boasson Hagen (Team Dimension Data); Sep Vanmarcke (Team EF Education First – Drapac P/B Cannondale); Tom Dumoulin (Team Sunweb); Diego Ulissi (UAE Team Emirates) and Wout Van Aert (Verandas Willems – Crelan). The women’s race, Strade Bianche Women Elite NamedSport and the UCI Women’s WorldTour opening race, started this morning at 09:12 with 137 riders. Did not start: dossard number 92, Marta Tagliaferro (Cylance Pro Cycling). Among the women who will challenge for victory the favourites are last year’s winner Elisa Longo Borghini (Wiggle High5); Sofia Beggin and Sofia Bertizzolo (Astana Women’s Team); Anna Van Der Breggen (Boels Dolmans Cycling Team); Pauline Ferrand Prevot; Elena Cecchini and Katarzyna Niewiadoma (Canyon // SRAM Racing), and Lucinda Brand and Ellen Van Dijk (Team Sunweb). Siena (09.15 – Women Elite Start): light rain 4°C. Wind: weak – 8kmh. Siena (10.45 – Men Start): rain 6°C. Wind: moderate – 13kmh. Siena (13.15 – Women Elite Finish): rain 8°C. Wind: moderate – 13kmh. Siena (15.30 – Men Finish): rain 10°C. Wind: moderate – 10kmh. It’s a twisty and undulating course, with no long climbs but punchy hills, most significantly on the unpaved parts. There are roughly 63km of gravel roads, across 11 sectors (eight of those shared with the Women Elite course). Starting from Siena (Stadium/Medicean Fortress area), the initial undulating kilometres are on Tarmac before reaching the 2.1km-long gravel Sector 1 at km 18, which is perfectly straight and slightly downhill. After few kilometres the riders then face Sector 2 (5.8km), the course’s first real challenge with a short descent followed by a long climb with sections of over 10% gradient. The course then goes through Radi, where gravel Sector 3 starts (4.4km; the second part of the race’s first edition gravel Sector 1) shortly followed by Sector 4 – named “La Piana” – and one of the race’s classic gravel sectors (5.5km in length and featured in the course since the first edition) with no significant gradient leading to Buonconvento. After few kilometres the second climb of the day starts: the Montalcino (4km at 5%). Following Torrenieri the riders face Sectors 5 (11.9km) and 6 (8km) with only 1km of tarmac in between. Both are hard, hilly, very punchy and with many bends, climbs and descents. After the second passage through Buonconvento the feed station will be positioned in the area of Ponte d’Arbia. Soon the route reaches Monteroni d’Arbia, which marks the beginning of Sector 7 of San Martino in Grania (9.5km) in the middle of the Crete Senesi. It’s a long sector with continuous up and downs in the first part, ending up with a twisting climb before meeting the Tarmac again. In Ponte del Garbo (Asciano) gravel Sector 8 begins. At 11.5km it’s the hardest of the race, mostly uphill and characterised by tough hills, the most important being those close to Monte Sante Marie, with steep gradients on both climbs and descents over short distances. After Castelnuovo Berardenga there’s a very short, flat section of gravel (300m) before facing, after Monteaperti, Sector 9 – only 800m long, but with a double digit gradient ramp before rejoining the tarmac in Vico d’Arbia and paved road through Pieve a Bozzone. Next comes the penultimate section of gravel (Sector 10, 2.4km) on the climb toward Colle Pinzuto (with gradients up to 15%). After a few kilometres the riders then face the last gravel section (Sector 11, 1.1km) which features a sequence of a demanding descents followed by a very punchy climb (max. 18%) that ends up at the Tolfe. From here only 12km separate the riders from the finish in Piazza del Campo, Siena. The demanding final kilometres, with gradients up to 16%, approach the city of Siena along broad, straight sections of road, connected by sweeping curves, first descents and slight climbs. 2km from the finish line, the route joins Via Esterna di Fontebranda; here the gradient touches 9%. 900m from the finish line, the race route passes beneath Fontebranda Gate where the road surface becomes paving slabs. The gradient then exceeds 10% until 500m from the finish line, reaching its highpoint of 16% along Via Santa Caterina. A sharp right hand turn leads to Via delle Terme, and then Via Banchi di Sotto. With 300m to go, the road continues to climb slightly then, 150m from the line, a right turn leads into Via Rinaldini. The route enters the Piazza del Campo just 70m from the finish line. The final 30m descends at a gradient of 7% and the finish line itself is flat. A twisty and undulating course, with no long climbs but with punchy hills – most significantly on the unpaved parts. There are roughly more than 30km of gravel roads across eight sectors (all shared with the Men’s course). After the passage through Buonconvento the feed station will be positioned in the area of Ponte d’Arbia. Soon the route reaches Monteroni d’Arbia, which marks the beginning of Sector 5 of San Martino in Grania (9.5km) in the middle of the Crete Senesi. It’s a long sector with continuous up and downs in the first part, ending up with a twisting climb before meeting the Tarmac again. After Castelnuovo Berardenga there’s a very short, flat section of gravel (300m) before riders face, after Monteaperti, Sector 6 – only 800m long but with a double digit gradient ramp before rejoining the Tarmac in Vico d’Arbia and going to paved road through Pieve a Bozzone. Next comes the penultimate gravel section (Sector 7, 2.4km) on the climb toward Colle Pinzuto (with inclines of up to 15%). After a further few kilometres the riders will face the last section of gravel (Sector 8, 1.1km) which features a sequence of a demanding descents followed by a very punchy climb (max 18%) that ends up at the Tolfe. From here only 12km separate the riders from the finish in Piazza del Campo, Siena. Final kilometres are the same as the men’s course. It would have been too difficult to decide between Piazza del Campo and Torre del Mangia, between the cathedral and the other buildings of the same complex, such as the baptistery, the crypt and the grand façade (known as “Facciatone”). So the entire old town centre was listed as a UNESCO World Heritage site for its outstanding artistic value. Siena is a true jewel of art, both sacred and profane at the same time, ever bustling with life and with more than a million visitors each year. It hosts major sporting and cultural events, such as the legendary Palio, staged twice a year, in which the 17 city quarters (“contrade”) challenge each other in front of large crowds coming from all over the country to attend the town’s most famous and iconic event. 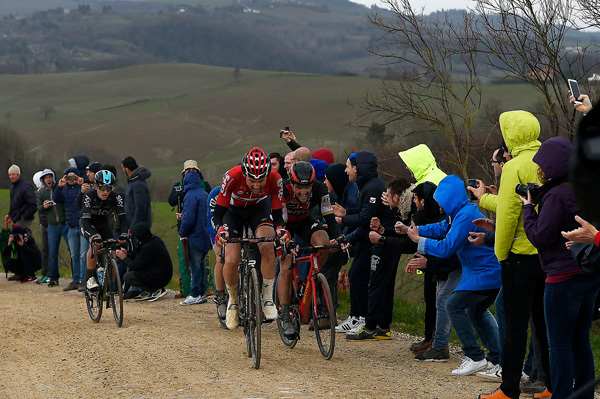 The Strade Bianche is a legendary race that perfectly fits into a historical context that serves as an excellent setting for both the race start and finish. While waiting for riders to fly by, spectators can explore the city’s monuments and enjoy the many local delicacies, including wild boar sauces and specialties, ribollita, panforte (Siena’s iconic dessert), as well as world-renowned, refined wines, such as Chianti. Ricciarelli, traditional pastries made from almonds, sugar and egg whites, are the perfect snack while waiting for the finish. Siena was founded by the Etruscans, it grew under the Romans, and was ruled by the Ghibellines and later the House of Medici. Nowadays, Siena belongs first and foremost to all those lucky ones who have visited or will be visiting this UNESCO World Heritage site. A must-see: Torre del Mangia. A must-taste: Ricciarelli. The best time to be in town: 4-5 March; or 2 July and 16 August – Palio di Siena. The world’s oldest Classics race, with its first edition in 1876, will feature many of the world’s best pro riders. Challenging last year’s winner Miguel Angel Lopez will be many top names including Dumoulin, Barguil, Quintana, Aru, Uran, Pinot, Chaves, Zakarin Landa, Kwiatkowski, Kruijswijk, Roglic, Dan Martin and Alaphilippe. Milan, 27 September 2017 – Many of the top names in professional cycling will be at the start of the 98th edition of Milano-Torino – the oldest Classic bicycle race, having been first run in 1876. Organised by RCS Sport/La Gazzetta dello Sport, its last edition was won by Miguel Angel Lopez, who will be challenged by, among others, his teammate Fabio Aru (Astana Pro Team), Giro d’Italia winner Tom Dumoulin and Tour de France mountains classification winner Warren Barguil (Team Sunweb), Giro runner-up Nairo Quintana (Movistar Team), Tour de France runner-up Rigoberto Uran (Cannondale Drapac Professional Cycling Team), Milano-Sanremo winner Michal Kwiatkowski and his teammate Mikel Landa (Team Sky) and others including Esteban Chaves and Adam Yates (Orica – Scott), Steven Kruijswijk and Primoz Roglic (Team Lotto NL – Jumbo), Daniel Martin and Julian Alaphilippe (Quick – Step Floors), Ilnur Zakarin (Team Katusha Alpecin) and Thibaut Pinot (FDJ). Die 5.Etappe der diesjährigen Tour of Britain fand bei windigen, aber trockenen Bedingungen im Seebad Clacton-on-Sea statt. Sie führte über die klassiche britische Distanz von 10 Meilen = 16,2 Kilometer. Die Fahrer hatten nach dem Start starken Rückenwind, was sich aber nach dem Wendepunkt auf dem Rückweg in starken Gegenwind verwandelte. Nach einer langen Zitterpartie rechte am Ende eine einzige Sekunde Bodnar zum Sieg. Nachdem der Pole von BORA – hansgrohe auf der 10. Etappe noch kurz vor dem Ziel eingeholt wurde, holte er heute den lang ersehnten Etappensieg in Marseille. Vor der „Tour d’honneur“ nach Paris morgen, stand heute das entscheidende Einzelzeitfahren in Marseille auf dem Programm. Ein 22,5 km langer Kampf gegen die Uhr, zwei Rennen, Eines um den Gesamtsieg der Rundfahrt, ein Zweites um den Tagessieg. Der Kurs war dabei durchaus auf die Spezialisten zugeschnitten. Ein schneller Start entlang des Meeres, gefolgt von einem kurzen, aber steilen Anstieg zum Wendepunkt bei Kilometer 15,6. Danach zurück zum Vélodrome, wo auch gestartet wurde. BORA – hansgrohe hatte mit Maciej Bodnar einen der Mitfavoriten am Start. Der Pole hatte bei der letzten Zeitfahrweltmeisterschaft den vierten Platz belegt, und zeigte bei dieser Tour bereits auf der 11. Etappe, wo er erst kurz vor dem Ziel vom Feld eingeholt wurde, dass seine Form stimmt. Neben Bodnar, musste auch Emanuel Buchmann noch einmal alles geben. Für den jungen Deutschen ging es um den 15. Rang in der Gesamtwertung der Tour, den er einen Tag vor dem Ende keinesfalls abgeben wollte. Mit Teamchef David Brailsford an der Spitze stellten sich am Mittwochabend die Fahrer des Team SKY den Fragen der Presse. Es starten in Düsseldorf: Chris Froome, Sergio Henao, Vasil Kiryienka, Christian Knees, Michal Kwiatkowski, Mikel Landa, Mikel Nieve, Luke Rowe, Geraint Thomas. Die meisten Fragen hatte naturgemäß der 3-fache Toursieger und Vorjahressieger Chris Froome zu beantworten. Er sieht sich in sehr guter Verfassung aber zugleich erwähnte er, dass ein vierter Erfolg bei der Tour die bisher größte sportliche Herausforderung seiner Karriere darstellt. Die wenigen Zeitfahr-Km und der Kurs in 2017 lassen auf ein offenes Rennen schließen und als einen der größten Favoriten sieht er seinen Freund und ex – Teamgefährten Richie Porte (BMC), der in der Form seines Lebens ist. Greg Van Avermaet (BMC Racing Team) is the new Maglia Azzurra NamedSport. 2 – Tom Dumoulin (Team Sunweb) at 9″. 3 – Peter Sagan (Bora-Hansgrohe) at 9″. 2 – Rohan Dennis (BMC Racing Team) s.t. 3 – Tejay van Garderen (BMC Racing Team) s.t. Die 52. Auflage des Corsa dei Due Mari (Race of the Two Seas) beginnt am Mittwoch, 8. März, mit vielen namhaften Fahrern. Die Strecke von Lido di Camaiore nach San Benedetto del Tronto umfasst einen Team Time Trial und einen Individual Time Trial, zwei Sprintstadien und ein Bergfinish auf dem Terminillo. Angefügt sind die vorläufige Eintragsliste und das vorläufige Betriebsprogramm. Mailand, 5. März 2017 – Die 52. Auflage des Tirreno-Adriatico NamedSport vom 8. bis 14. März, organisiert von RCS Sport / La Gazzetta dello Sport, zeichnet sich durch eine außergewöhnliche Besetzung aus. Das Rennen verbindet das Tyrrhenische Meer mit der Adria durch sieben Etappen: ein Team Time Trial und ein Einzelzeitfahren öffnen und schließen das Rennen; Dazwischen gibt es zwei Etappen für Sprinter, zwei für Finisseurs und ein aufsteigendes Ende des 1.675m Monte Terminillo (Campoforogna). Viele große Fahrer werden erwartet, um die Corsa dei Due Mari zu starten. Zu den GC-Anwärtern gehören Nairo Quintana (Movistar Team), Gewinner des Corsa dei Due Mari im Jahr 2015; Vincenzo Nibali (Bahrain-Merida), der Sieger des Giro d’Italia im Jahr 2016, der nach dem Sieg in 2012 und 2013 seinen dritten Sieg erringt. Weitere Konkurrenten sind Fabio Aru (Astana Pro Team), Thibaut Pinot (FDJ), Bauke Milema (Trek-Segfredo), Tejay van Garderen (BMC Racing Team), Tom Dumoulin (Team Sunweb), Geraint Thomas und Mikel Landa (Team Sky), Adam Yates (Orica-Scott), Rafał Majka (Bora-Hansgrohe), Rigoberto Uran (Cannondale-Drapac Pro Radsport-Team) und Rui Costa (UAE Abu Dhabi), der jüngste Sieger der Abu Dhabi Tour. Der polnische Fahrer Michał Kwiatkowski (Team Sky) hat die 11. Auflage von Strade Bianche NamedSport gewonnen, zum ersten Mal Teil des UCI WorldTour, die 175 km von Siena (Fortezza Medicea) nach Siena (Piazza del Campo) . Mit dem Sieg auf der Ziellinie des historischen Platzes schlug Kwiatkowski das belgische Duo Greg Van Avermaet (BMC Racing Team) und Tim Wellens (Lotto Soudal), um seinen zweiten Strade Bianche NamedSport Karriere-Sieg zu sichern. Siena, 4 March 2017 – Today Michał Kwiatkowski made it two as by winning the Strade Bianche NamedSport for the second time adding to his first victory in 2014, the year he became the first Pole to win the Elite world championship for road racing. He rode away solo with 15km to go from a group of top contenders including Ždenek Štybar and Greg Van Avermaet. The reigning World Champion, Peter Sagan, was forced to pull out due to illness after 114km of the race.